For some time many in the media and the general public liked to make fun of environmentalists as alarmists and “tree-huggers.” Watching the disaster in Japan unfold reminds me why I do the work I do, and more importantly, why when government officials assume me that their sketchy toxic projects are fail-safe, deep down I know they absolutely have no clue about what they are talking about. 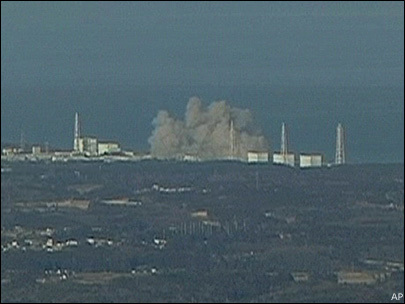 Nuclear power plant explosion in Japan. WAKI, Japan (AP) – Cooling systems failed at another nuclear reactor on Japan’s devastated coast Sunday, hours after an explosion at a nearby unit made leaking radiation, or even outright meltdown, the central threat to the country following a catastrophic earthquake and tsunami. The Japanese government said radiation emanating from the plant appeared to have decreased after Saturday’s blast, which produced a cloud of white smoke that obscured the complex. But the danger was grave enough that officials pumped seawater into the reactor to avoid disaster and moved 170,000 people from the area.